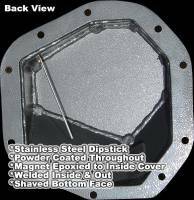 Gear Armor Cover for the Dana 44 The name says it all, this is the strongest differential cover on the market. Starting with a .500 thick steel flange that is CNC plasma cut for an exact fit for the Dana 44 axle. Then the .375 thick cold rolled steel exterior is cut and welded into place, welded inside and out. Cover features 45 deg. Bottom angle faces, to deflect rocks rather than sitting on top of them. An integrated stainless steel drain plug that cannot be sheared off, a stainless steel top fill plug and combination dipstick to make filling and checking fluid levels a breeze. A heavy-duty magnet is epoxied on the inside bottom of the cover to catch any metal particles that may be in your fluid; all mounting holes are counterbored to protect the stainless steel mounting bolts. 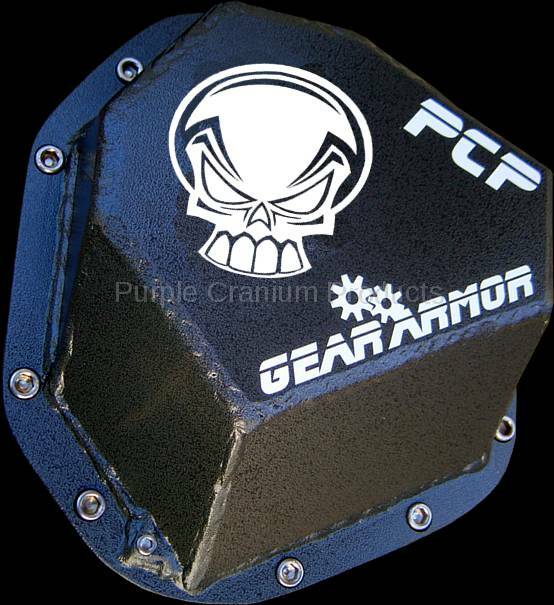 The Gear Armor Cover will replace the stock 44 cover, front or rear, an exact replacment. No need to modify any steering components. Our cover sits .375 higher than stock, from gasket surface to face The Gear Armor Cover is aprox. 3.125". Also consider your sway bar, steering shocks, etc, before ordering. Although everything is taken into consideration when designing the Rock Crusher, there are numerous factory and aftermarket options that have not been considered. The Dana 44 has been widely used by just about all the truck manufactures. A stock Dana 44 cover weighs only 1 1/2 pounds, the Gear Armor Cover weighs in at 12 pounds, 12 pounds on solid steel protection. All covers are powder coated a black hammertone inside and out and all stainless steel fasteners are included. If you are looking for a bulletproof top shelf cover, look no further. This item is not in stock, will take up to 4 weeks to ship.